I don’t watch a lot of short films. As such, I never quite know what to make of them. So much needs to be contained in a relatively short space of time and while the narrative structure is clearly the same, with a beginning middle and end, it always feels different to me. So, I struggled thinking of something to write about Dawn, the directorial debut from actress Rose McGowan. But I was so struck by the film, that I needed to post about it. McGowan has been one of my favourite actresses for something like 15 years. Lately, I’ve come to admire her for more than her acting and outsider status but also for her outspokenness on feminist and other issues. To say I was excited that McGowan had finally turned her hand to directing was an understatement. And that the film is set in the ’60s is even better! 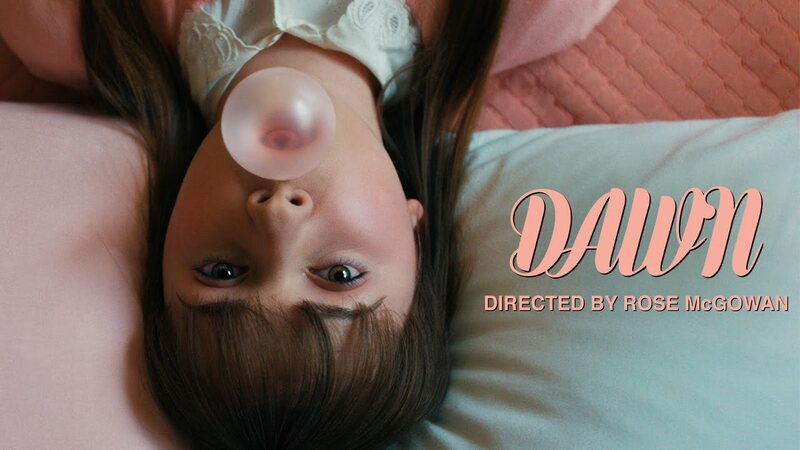 Dawn is about a young girl, living a sheltered life in 1960s America, who daydreams of something beyond her cookie cutter existence. Dawn is a cautionary tale. We hurt girls with casual negligence. We change the course of lives with a stereotypical view shared thoughtlessly. We shape the minds of the innocent. Let’s think different and be better. My inspirations were varied – I wanted the color palette of The Parent Trap (1961) the loneliness of an Edward Hopper painting, the driving tension of Night of the Hunter mixed with Hemingway’s unsparing style of editing. These greats are my teachers. McGowan does an excellent job at creating the world in which this film exists: a bubblegum pastel vision of the 1960s with crisp, meticulously created sets, character perfect costumes and deliberately delivered lines. The eeriness is there, underneath it all, from the beginning. In the slightly stilted acting (on purpose! ), in the too-perfect sets and costumes. It is more than real, and this unsettles. Creepy girlhood movies are always appealing to me. I feel like this would make an interesting companion piece to Stoker – though they are quite different stories, about very different people, I think there are similarities in atmosphere that link these films in my mind. I know this is mostly about the visuals but I still haven’t entirely grasped the film, as a whole. I need to watch it again. Let it sink in a bit more. Plus, it’s probably evident by now that the visuals are what I pay the most attention to. In terms of soundtrack, the inclusion of Young Love by Tab Hunter pleased me. His impassive singing was a perfect fit for the atmosphere of this short. Tara Lynne Barr, who plays the titular character, reminded me of Christina Ricci (and seeing YouTube comments, I’m not the only one who thought this), another of my favourite actresses (along with McGowan) from my childhood/teen years. From her cheerful naïvety, to her tearful realisation at the conclusion, Barr was excellent as Dawn. I’m excited for more directorial efforts from McGowan, the next being a feature length film called The Pines, an ‘art thriller’, set in 1971. You can watch Dawn for free on Rose McGowan’s YouTube channel (I’ve embedded the video above for convenience).